The 20TH ANNIVERSARY WATERCOLR MONTAGE – Each member picked a layout and signed their names in a vertical or horizontal layout box. Images can be of anything that strikes your fancy on the campus of the Altamonte Chapel. 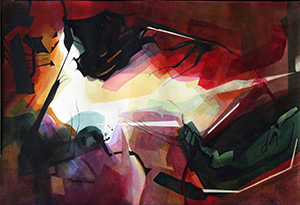 The artwork will be presented to the chapel at our March 15 reception. See Janet Asbury for more details. Don’t miss out! October 20 – Backyard Biodiversity Day 9 – 3, at Mead Gardens. Hosted by Fla Native Plant Society, Tarflower Chapter. We’ll be participating, with plein air painters. Karen and I will teach at kids corner. 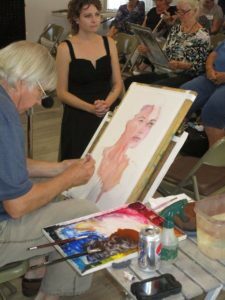 There will be oil painters there as well, so a chance to explain to families how watercolors are different. 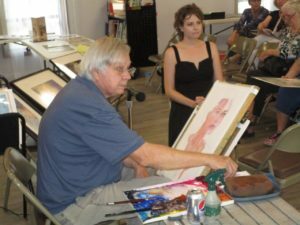 Faye announced we still have a few openings for the Niko Floyd drawing workshop on Nov. 3, at the Lake of the Woods Clubhouse! 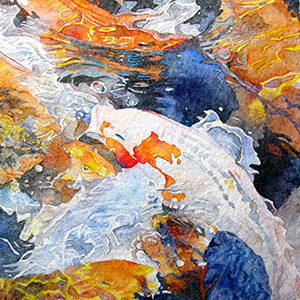 The Florida Watercolor Convention was a blast! I saw Chauncey’s wonderful demo, Steve Rogers, Ted Head, Jamie Cordero, Sue Cotton, Lynn Ferris and Robin Lee Makowski – the digital director for FWS. She talked about how to do the CaFé submissions. 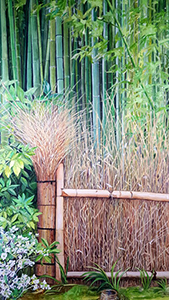 . . FWS 2019 Non-Signature Member Online Show submissions Oct. 6 – Dec. 3..
Jane announced – CFWS invited to exhibit about 20 -24 paintings in the public offices of the Orange County Property Appraiser from November 5 – January 4, 2019. Deadline to submit your images is Friday October 12. Nov. 4 meeting will start at the sanctuary then move to the social hall 1.) 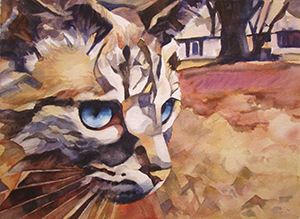 Jane Brinckerhoff will be presenting a slide show on how to resize images for competition in art shows. This is very important for all artists wanting to enter shows. 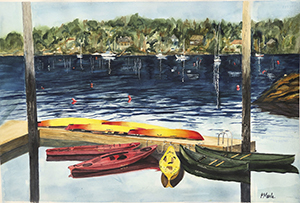 All watercolor societies are going digital. 2.) 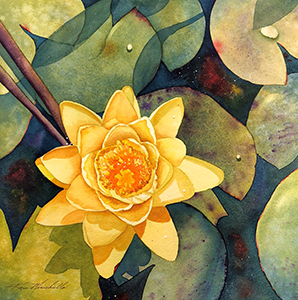 Special Guest Rachel Frisby, Curator, Polasek, will be speaking: “Precious Pollinators: The Central Florida Watercolor Society,” Exhibition: May 7 – August 25, 2019. A fascinating glimpse into art surrounding one of our most important natural resources, the bee and other pollinators. 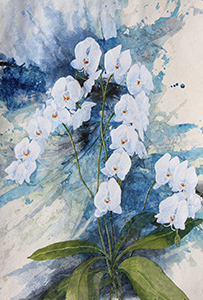 The Polasek gives center stage to the plight of this conservation issue through a celebration of color, native flowers and plants all expertly executed in watercolor. 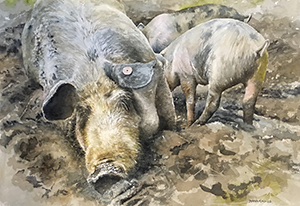 All exhibited works will come from the vast membership of the Central Florida Watercolor Society, which boasts many professional and award-winning artists. Bee mindful of all the beauty that is a direct result of the humble and hardworking bee and learn what each of us can do to help save pollinators. 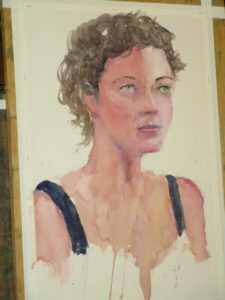 Silent Auction – something new we are trying for 6 months, at our meetings. We are putting up our formerly used Sony Handycam HDR – CX 330 which does video and still photography for auction. Information and sign up sheets are at the meetings. He likes to use Arches paper. He paints in 3 colors mostly. Drawing is measuring, adjusting, correcting. He uses the “Golden Mean” for composition. 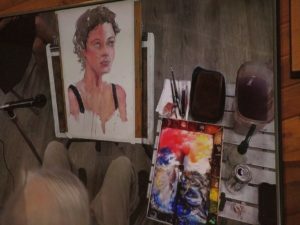 He started his painting using DaVinci Red Rose deep and M. Graham Azo Yellow for basic flesh tone. Mix a BIG puddle. 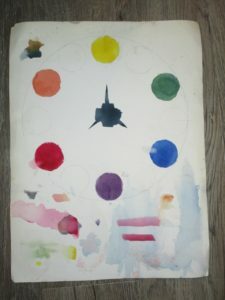 Push up a Cerulean blue into the red, for a violet. Push it into the orange for a brown. Then make puddle of Cobalt. Ultramarine on the far end. Sometimes he cheats with Burnt Sienna into Ultramarine blue for good grey or brown. Her hair is burnt sienna plus cobalt then ultramarine. It can be painted in 3 to 5 layers. Pull out highlights with brush. He refers to handprint.com for everything about watercolor paints that you would want to know. mixing the paint .. thin or thick? He starts with milk/cream consistency, then goes down to tea. paper … wet or dry? Paint wet into wet or not. At the end of the meeting, our model won the 50/50 drawing! It was lots of fun!